As my friends know, living in Pennsylvania has given me a soft spot for breweries in states with antiquated liquor laws. That means I love breweries in Utah. So when I saw the new Crooked Line series by Salt Lake City's Uinta Brewing Co. (via beernews.org, of course, and Utah Beer blog), I was intrigued. I was particularly curious about the variety of styles you can see in the label art. Our news labels were done by local Utah artists. Uinta wanted to reach out with our new Crooked Line and support local artists by choosing different artists to design the different labels. For our first four releases for this line we used 3 artists, Leia Bell (Tilted Smile and Detour label), Travis Bone (Cockeyed Cooper label), and Trent Call (Labyrinth label). The process was really great. We met went to their studios to meet them and see their individual styles and from there we assigned them the beer names and gave them the artistic freedom to design the labels. It was a really fun process and we are excited to work with more local artists for all of the Crooked Line releases to come in the future. 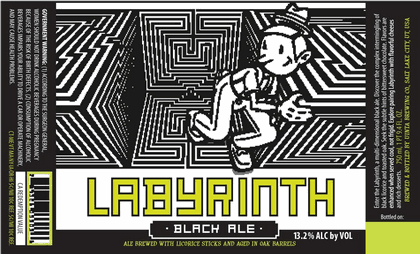 Trent Call's Labyrinth Black Ale label is a pretty cool look. Kind of Frank Stella in the background (one of my favorite postwar artists), combined with a playful figure to keep it light. 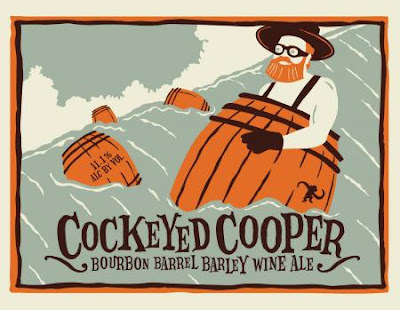 Poster/printmaker Travis Bone uses a much more retro style to make the image for the Cockeyed Cooper label. I find this funnier the longer I look at it; the dude going over the falls in the barrel is just a little bit hilarious, and it makes sense for the big aged beer. I mean, there's even a monkey on the side of the barrel. Nice choice to keep the palette simple; using a ton of colors here would have screwed up the look. Lastly, we have the two images by Leia Bell (caution, there are adorable animals on her site). Both simple, line-driven pieces. 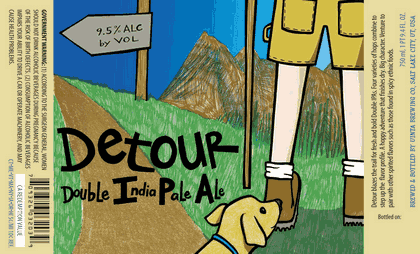 The Detour is mainly driven by the dog and the big color fields with the visible pencil marks for texture. 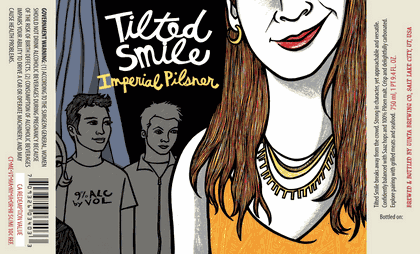 The Tilted Smile piece is obviously driven by the wry smile, with the kind of weird-looking friendly guys behind the chick who is in color. The style is similar to some of that found in graphic novels (aka comic books). The interesting thing for me is that they are so compositionally similar, with elements along the bottom and up the right side, with a space in the top left for the beer name. So Uinta (pronounced you-in-ta) has opted to develop a visual identity for this series that is united only by the local nature of the artists, rather than a crafted branding identity. I admit, I was a little surprised to realize this is the same brewery that makes the overly slick design of the Four Series. I admire the cohesion of the Four Series design campaign, but I love the use of local artists for the Crooked Line series. All of which goes to this point, which is also definitely true in beer: You can not judge a brewery's style by one beer, or even one line of beers. There are many, many breweries that produce a line of beers (even flagship beers) that are mild or even underwhelming to sophisticated palates, but that also produce insane seasonal or specialty beers. And there are breweries whose art on one label might scream macro, widely-acceptable branding, but that do immensely interesting and challenging design on another label (or inside the brewery, or wherever). One of the great things about craft beer is that the same people at the same brewery are capable of incredible diversity and breadth. Uinta now has at least three lines of beers, each with visual identities so distinct you have to be told their from the same brewery in Salt Lake City. At certain large, corporate breweries, that might be considered bad business. At a craft brewery, it's quite often par for the course. Is that cool, or what?